The Chilean Army (Spanish: Ejército de Chile) is the land arm of the Military of Chile. This 50,000 army (9,200 of which are conscripts) is organized into six divisions, a special operations brigade and an air brigade. In recent years, and after several major re-equipment programs, the Chilean Army has become the most technologically advanced and professional army in Latin America. The Chilean Army is mostly supplied with equipment from Germany, the Netherlands, Switzerland, the United States, Israel, France, and Spain. The National Army of Chile was created on December 2, 1810, by order of the First National Government Junta. The army was actively involved in the Independence War, which was fought against royalist troops in battles such as Yerbas Buenas, San Carlos, Quechereguas, Rancagua, Chacabuco and Maipú. During this period, national figures such as José Miguel Carrera, Bernardo O'Higgins and Argentinian General José de San Martín commanded the army toward definitive victory over the Spanish forces, ultimately achieving independence for the country. The Army's first commander-in-chief was José Miguel Carrera. After obtaining independence from Spain, the newly formed Republic reorganized its military structure by creating the Military Academy of Chile, which was founded by General O'Higgins in 1817. Diego Portales set up a civil militia, the Guardia Nacional, to end one of the worst stages of militarism in Chilean history. The militia was created in 1825 Portales developed this parallel army to compensate the army's might. The Chilean Conscription Law of 1900 marked the beginning of the end of the Guardia Nacional. During the War of the Pacific, many high-ranking officers won valuable insights into the state of the army and became aware that the army required rebuilding. Losses, material destruction, and organizational flaws regarding strategic planning and officer training, were noted by officers like Emilio Sotomayor and Patricio Lynch, who approached President Santa María arguing the need of good schools and technical departments for the military. Other factor that supported the emulation, the deliberate systematic imitation of the military technology, organisation, and doctrine of one country by another[Notes 1] was the danger of war with Argentina. The emulation was backed by a broad coalition of civil and military leaders. The emulation was focused in armaments, conscription, officer recruitment and instruction, and general staff organization as well as military doctrine (adopted 1906). It was extended also into military logistics and medical services, promotions, retirement, salary regulation and even uniforms (adopted 1904), marching styles, helmets, parades, and military music. The Guardia Republicana or Milicia Republicana was created after the fall of the Socialist Republic of Chile in order to prevent another Coup d'Etat. On May 7, 20,000 militiamen marched past President Arturo Alessandri in the streets of Santiago. In Las Mercedes' plot, 1933, the Commander-in-Chief of the Army, Pedro Vignola called "to resist the Milicia Republicana by any means" and he was forced to retire from his post. In 1936, the militia was disbanded. During the decades previous to the coup, the Chilean Army became influenced by the United States' anti-communist ideology in the context of various cooperation programs including the US Army School of the Americas. Once the military had demobilized the polity and society, the regime began implanting its vision of a new order. It set out to replace not only democratic with authoritarian politics but also statist with market-driven economics. The Army, with now Captain General Augusto Pinochet, leader of the coup, as Commander-in-chief of both the Army and the Armed Forces, led the national mobilization effort in 1978 as the Beagle conflict began to hit the country. The Army was on full alert status during the duration of the crisis. Patricio Aylwin became elected President of the Republic on December 14, 1989. Although Chile had officially become a democracy, the Chilean military remained highly powerful during the presidency of Aylwin, and the Constitution, amended by Pinochet's regime, ensured the continued influence of Pinochet and his commanders. As a result of tensions with neighbors during the conflict-prone 1970s and early 1980s, the Chilean Army refined existing strategic concepts and eventually formulated a plan to restructure its forces. Though wars were avoided, the threats from the 1970s and 1980s encouraged the army to address more effectively its major defense disadvantage: lack of strategic depth. Thus in the early 1980s it looked outward for a model of army organization that would best advance defensive capabilities by restructuring forces into smaller, more mobile units instead of traditional divisions. The resulting Plan Alcázar envisions three military zones in Chile, with the bulk of forces concentrated in the north, and reinforces the center and south. The plan was implemented in stages, starting in 1994. Thus Alcázar, based on threat scenarios of the past, is one of the most durable "lessons" of the past. [clarification needed] Even with the resolution of almost all remaining territorial disputes, the restructuring agenda continued, reinforcing a conflict-based mindset in the army. 1969 El Salvador-Honduras conflict (OAS mission). Army General Headquarters, in Santiago. Land Operations Command, headquartered in Concepcion. 1st Army Division: Regions II and III, with headquarters in Antofagasta. 2nd Motorized Division: Regions IV, V, VI, VII and Santiago Metropolitan Region with headquarters in Santiago de Chile. 3rd Mountain Division: Serving Regions VIII, IX, XIV, and X with headquarters in Valdivia. 4th Army Division: Region XI with headquarters in Coyhaique. 5th Army Division: Serving Region XII with headquarters in Punta Arenas. 6th Army Division: Serving Regions I and XV, with headquarters in Iquique. Army Aviation Brigade: with headquarters in Rancagua (Brigada de Aviación del Ejército). It is the Army's aviation force, composed of 4 battalions and a logistics company. Special Operations Brigade "Lautaro": with headquarters in Peldehue (Brigada de Operaciones Especiales "Lautaro"). It is the Army's special forces brigade, named after one of Chile's national heroes. 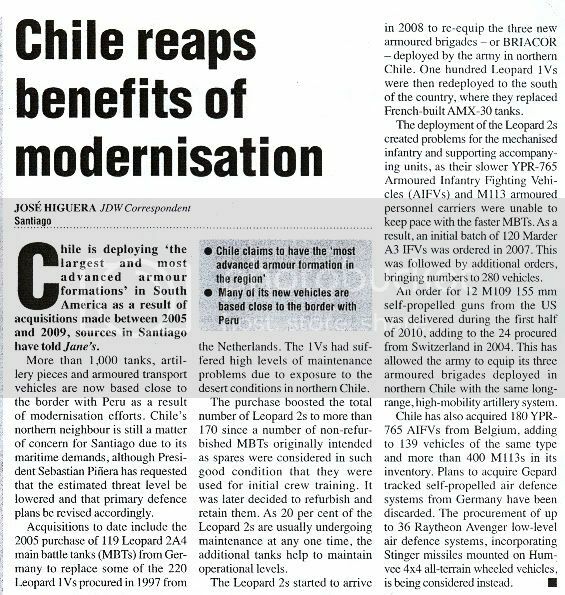 The Chilean Army has acquired a number of new systems with the goal of having a completely modernized, and largely mechanized army by 2015. The military has also modified the operational structure, creating armoured brigades throughout the entire territory and a new special operations brigade, while preserving the current divisional scheme. Chile Main pistol. Locally produced version of the CZ-75. Chile Standard issue submachine gun. Locally designed variation on the SG 540. Israel Standard issue rifle, replacing SIG 540. Germany 120 mm gun. May be upgraded to 2A5CHL in the near future. Chile Built under license in Chile by FAMAE, in various configurations. In 2013, there were 3,900 officers, 17,300 NCOs, 3,600 professional soldiers, and 9,200 conscript soldiers. In military schools, 2,400 students. Civilian employees, 8,400. The Chilean Army is famous for its elaborate drill, exhibited in large scale during the Día de las Glorias Navales on 21 May and the Parada Militar de Chile (Great Military Parade of Chile) on 19 September. The early armed forces adopted many Prussian military traditions, and it was during this period that the Chilean military had many of its most famous victories. As a result, the drill features many 19th and early 20th century Prussian and German patterns. Participating soldiers wear stahlhelm and pickelhaube helmets and march in unaltered stechschritt. Marching music consists of Central European marches, alongside several local compositions. Each Parada Militar on 19 September ends with a playing of Preußens Gloria (played in 2007–2017), Preussischer Präsentiermarsch (first played in 2018) and Los viejos estandartes by a mounted band playing in the German tradition. Pickelhaubes have been worn by the Military School and since recently by the 1st Cavalry Regiment and the 1st Artillery Regiment, and the stahlhelm only by the NCO School. This is also the cases on parades held on 18 September, Independence Day, in the local level, whenever Army units take part. 1st Infantry Regiment "Buin" - Grenadier uniform of the 1st Infantry Battalion "Chilean Grenadiers"
^ Joao Resende-Santos in Neorealism, States, and the Modern Mass Army (page 3, 9-10) uses "emulation" instead of "prussianization" as a broader term. He says: "Crossnational emulation occurs in a wide variety of areas and by an equal variety of state and nonstate entities ... Emulation in all forms, by firms or states whether in economic or military areas is driven by the same pressures of competition and based in the same political criterion"
^ a b c "Memoria del Ejército de Chile 2013". 8 January 2015. p. 381. Archived from the original on 13 April 2015. Retrieved 6 April 2015. ^ "About this Collection - Country Studies". loc.gov. Archived from the original on 24 May 2012. Retrieved 9 May 2018. ^ "Chile". state.gov. Archived from the original on 10 May 2018. Retrieved 9 May 2018. ^ William F. Sater; Holger H. Herwig (1999). The Grand Illusion: The Prussianization of the Chilean Army. U of Nebraska Press. pp. 204–. ISBN 0-8032-2393-5. ^ Paul W. Drake; Ivan Jaksic (1995). The Struggle for Democracy in Chile. U of Nebraska Press. pp. 4–. ISBN 0-8032-6600-6. ^ "Chile's armed forces receive 12 M109A5 155mm self-propelled howitzers". worlddefencenews.blogspot.com. Archived from the original on 10 May 2018. Retrieved 9 May 2018. Resende-Santos, Joao (2007). Neorealism, States, and the Modern Mass Army. New York: Cambridge University Press. ISBN 978 - 0 - 521 - 86948 - 5. Bawden, John R (2016). The Pinochet Generation: The Chilean Military in the Twentieth Century. Tuscaloosa: University of Alabama Press. ISBN 978-0817319281.